7/2 Cup of Coffee: Portland and the DSL Red Sox picked up sweeps on the night, but the rest of the affiliates lost. 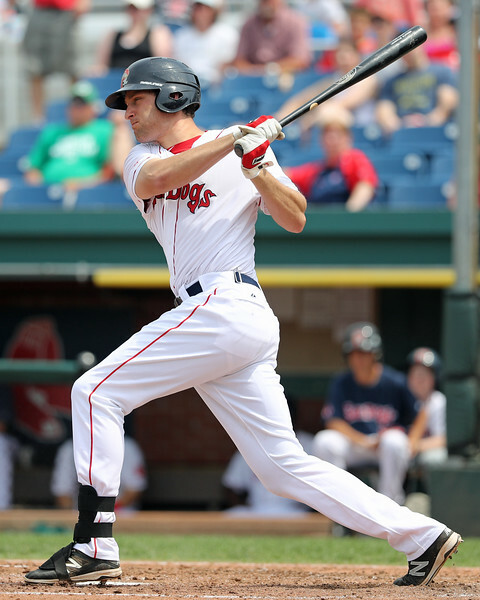 The Portland offense rolled behind home runs from Nate Freiman (pictured) and Yoan Moncada. Henry Owens’ command problems persisted while Trey Ball and the Salem bullpen struggled mightily. A three-run home run in the top of the sixth inning vaulted Columbus ahead on a night when the PawSox outhit their opponent 9-5. While starter Henry Owens allowed just four hits in 6 1/3 innings, two of them were home runs. His control problems continued as well, leading to five walks. Kyle Martin and Wesley Wright allowed just one hit after relieving Owens. Henry Ramos and Jantzen Witte led the offense with 2-for-4 days. Jose Vinicio made the most of his one hit, ripping a two-run triple in the fifth. Chris Dominguez also added a home run. The power bats were on display early in the front end of a twin bill in Portland. The Sea Dogs hit three home runs in the first three innings and rode the early lead to victory. Two of the blasts were courtesy of first baseman Nate Freiman. He started the power party with a two-run shot in the bottom of the first, and after Tim Roberson added a solo blast in the third, Freiman rocketed his second to center field. Portland starter Kevin McAvoy overcame a couple early runs to pitch five strong innings. Ty Buttrey picked up the save with two innings of one-hit ball. The Portland offense kept right on rolling in the nightcap, getting home runs from Cody Decker and Yoan Moncada. Moncada drove home five runs on the night, adding a two-run double to go with his three-run home run. Andrew Benintendi, Tim Roberson, and Aneury Tavarez each contributed two hits to the offensive outburst. The pitching did its job as well, surrendering just one earned run in the seven-inning contest. Nik Turley allowed three hits and one run in the first four innings, Taylor Grover followed him with two scoreless frames, and Austin Maddox was hung with one unearned run in the final inning. The game was tied as late as the eighth before Fredrick racked up six runs off of relievers Simon Mercedes and German Taveras in the bottom of the frame. Trey Ball struggled in five innings, coughing up five runs on six hits. Salem’s top four hitters did most of their damage. Joseph Monge, Rafael Devers, and Nick Longhi each chipped in a single and a double to the team’s nine-hit effort. Wendell Rijo went 1 for 4 with an RBI and two runs while catcher Jordan Procyshen blasted his first home run of the season in the top of the third inning. The Greenville offense never showed up in a 6-0 blowout loss. The Drive managed just three hits and struck out nine times. Tyler Spoon, Tate Matheny and Austin Rei each singled, but the top three batters in the lineup (Luis Alejandro Basabe, Luis Alexander Basabe, and Josh Ockimey) combined to go 0 for 12 with four strikeouts. Starter Anderson Espinoza allowed just two runs but lasted only 3 2/3 innings. Austin Glorius was knocked around for six hits and three runs in 2 1/3 innings out of the bullpen. The Aberdeen lineup battered the Spinner pitchers all night Friday. Darwinzon Hernandez allowed just one run in the first three innings, but reliever Pat Goetze was tagged for four in one innings. Steve Nogosek struck out the side but allowed a solo homer in his inning of work. Dioscar Romero yielded another two runs in the final frame. Offensively, Nick Sciortino blasted his first home run in the bottom of the third, and Roldani Baldwin drove in the second run with a single. Matt McLean went 2 for 2 with a pair of walks out of the leadoff spot, but he and Sciortino were the only Spinners to reach base more than once. Despite the Red Sox and Twins matching each other with 12 hits, the Red Sox ran away with a 6-1 victory. The Red Sox capitalized on its opportunities, including three runs in the second inning. Stanley Espinal had a big game, blasting his second home run of the year in the third and singling home a run in the sixth. Juan Barriento had a nice day at the dish, going 2 for 5 with a pair of doubles and two RBI. Starter Jacob Dahlstrand scattered eight hits and struck out five batters in five innings of work to get his first win. Jhonathan Diaz tossed three scoreless innings and Marcos Lantigua tossed a perfect ninth. The Red Sox broke out the sticks early and often in a blowout of the Marlins. Eddy Reynoso started the scoring with an RBI triple in the first inning, and the offense scored in six of eight innings. Each of the first seven batters in the Red Sox’ lineup knocked at least two hits. Reynoso finished the night with three runs scored and two batted in. Carlos Pulido and Luis Hernandez each ripped three hits. Starter Ritzi Mendoza took the lead and ran with it, picking up the win with 5 2/3 innings of one-hit ball. Manuel Ramirez looked strong in 1 1/3 innings of relief, not allowing a hit and striking out two. The Red Sox broke out with four runs in the fourth and three more in the seventh to take a big lead. Bryan Mata struck out seven and picked up the win on the mound with five innings of four-hit, two-run baseball. Shair Lacrus held the Rangers scoreless over the next three innings of relief. Pedro Castellanos opened the scoring with a solo shot in the fourth, part of his 2-for-4 day. Rafael Rincones also did much of the damage for the Red Sox with three hits and four RBI. Everlouis Lozada was the only other Red Sox batter to pick up two hits. Player of the Night: Offense was not scarce in Portland’s doubleheader sweep, but Nate Freiman contributed the biggest fireworks, launching two home runs in consecutive at-bats in the first half of the twin bill. After the 2-for-3 day, Freiman his hitting .277 and supporting an impressive .828 OPS. Freiman was a big league contributor as recently as 2014 with the Oakland Athletics but is trying to work his way back after signing with the Red Sox earlier this season.